As my torn back muscles slowly recover I have tried a couple of gentle sorties in an attempt to catch a fish or two. Today, in bright sunshine (and shirtsleeves), I had a walk down the river with my plugging rod. In fact I was trying out some new (to me) braid, Varivas Sea Bass Max Power - bloody expensive but incredibly fine. I wanted to see how far I could cast small light plugs in search of chub, perch, etc. on the 15lb braid. One of the problems with very small, unjointed, plugs is the fact that often the hooks either lock together on the cast or the front treble catches on the lip of the lure. When this happens on 50% of your casts it becomes a real pain so I now remove the front treble and replace it with a heavy split ring. The idea is that the lures are so small that they are likely to be engulfed and so the absence of a treble makes little difference. Not surprisingly, after the long spell of fairly rainless weather, the river was about as low as it could get. I started off with my modified plug - a slow sinker about the size of a middling minnow. The small lure cast like a rocket on the fine line and for the first time ever I was able to drop it close to the far bank even on the widest stretches (40-50m?). Nothing showed in the first pool (usually my banker for a few perch) so I moved on downstream. In the shallower water I had a couple of plucks and dropped a decent perch after playing it to my feet. Better! I walked on downstream to a third spot in the tail of another pool. 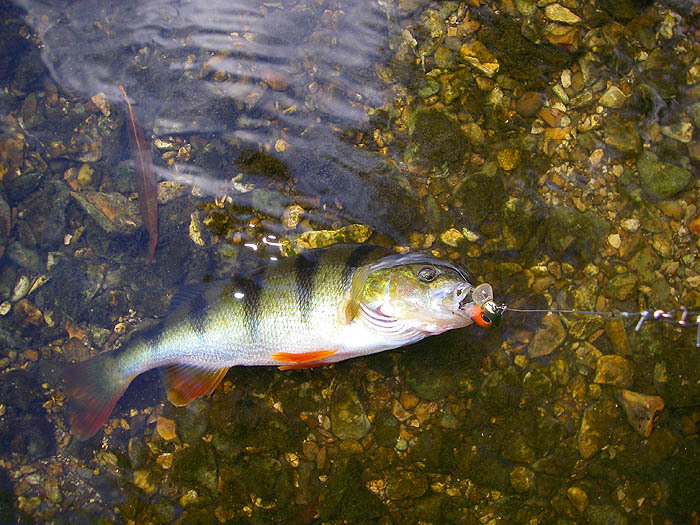 Almost at once I was into perch and I landed several reasonable fish on successive casts. This was encouraging. The rest of the stretch produced nothing so I switched to a small, jointed Rapala for the upstream leg of my walk. 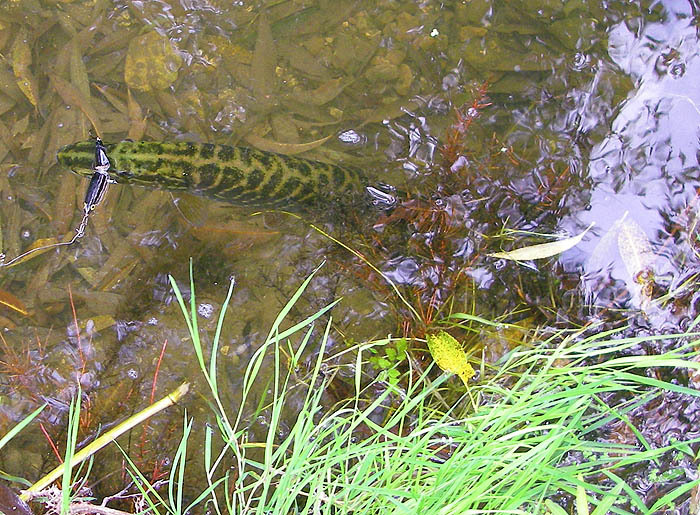 The only result was one little pike and another of about five pounds that followed in without taking. By now the back was starting to ache so I packed in and went home, reasonably well satisfied with the session and delighted with the line.